During human meningococcal infections, bacteria accumulate and finally fill up blood vessels, causing severe diseases such as septicaemia and meningitis. However, the mechanisms governing formation of bacterial aggregates and their impact on infection remained elusive. In this multidisciplinary work we unravel that aggregates of Neisseria meningitidis behave as a viscous liquid similar to honey. This is due to type-IV pili, long adhesive filaments which are constantly extending and retracting at the bacterial surface. By these means, bacteria can find each other and transiently come into contact. Aggregation is therefore based on an intermittent process of attraction between bacteria, and gives rise to a new type of active material. Importantly, the unique physical properties of meningococcal aggregates allow them to gradually adapt to the complex geometry of the vascular network. As a consequence, these physical properties are essential for the progression of infection. Living cells can sustain out-of-equilibrium states in a given environment by consuming free energy. The formation of some intracellular mineral phases provides some examples of this. Here I will review some of the work we have performed in the last years to describe and understand how some cyanobacteria, which are abundant photosynthesizing bacteria appeared several billions years ago at the surface of the Earth, manage to form intracellular amorphous carbonates. I will show the environmental conditions under which they catalyze this process, detail the methodologies (including cryo-TEM and spectroscopies) we used to characterize these phases and finally address the involved (bio)molecular mechanisms. The question of the selective advantage(s) provided by this process, if any, will be asked. The implications for basic and applied research will also be addressed. Overall, this talk should convince you that a highly interdisciplinary work is crucially needed to globally understand this intracellular biomineralization process. Bax and Bak are key regulators of apoptosis and mediate the permeabilization of the outer mitocondrial membrane that leads to cytochrome and Smac release. Although it is widely accepted that Bax and Bak function and molecular mechanism largely overlap, there is limited evidence how Bak works. In previous studies, we have used single molecule microscopy to characterize the oligomerization of Bax in the membrane and its organization at the nanoscale in the mitochondria of apoptotic cells. We now extended these approaches to Bak and identified key structural differences between the two proteins that may have functional implications. In vertebrate embryos, cilia-driven fluid flows are guiding left-right body symmetry breaking within the left-right organizer (LRO). To investigate the generation and sensing of flows, it is required to quantify cilia biophysical features in 3D and in vivo . In the zebrafish embryo, the LRO is called the Kupffer’s vesicle (KV) and is a spheroid shape cavity, which is covered with motile cilia distributed at its surface and oriented in all directions of space. This transient structure varies in size and shape during development and from one embryo to the other. As a consequence, the experimental investigation of cilia properties is challenging. It requires quantifying cilia features in vivo and in 3D and combining the data from different embryos to compare one embryo to the other and perform statistical analyses.To reach this goal, we devised an experimental workflow combining live 3D imaging using multiphoton microscopy, image processing, and data registration to quantify cilia biophysical features, such as cilia density, motility, 3D orientation, or length. We integrated such experimental features obtained in vivo into a fluid dynamics model and a multiscale physical study of flow generation and detection. This strategy enabled us to demonstrate how cilia orientation pattern generates the asymmetric flow within the KV . In addition, we could investigate the physical limits of flow detection to clarify which mechanisms could be reliably used for body axis symmetry breaking . Finally, we discovered the distribution of cilia orientation is asymmetric within the KV . Importantly, these results suggested that the asymmetric force detection could result from the cilium being sensitive to its own motion. Together, this work sheds light on the complexity of left-right symmetry breaking and chirality genesis in developing tissues. Animal cells in tissues are supported by biopolymer matrices, which typically exhibit highly nonlinear mechanical properties. While the linear elasticity of the matrix can significantly impact cell mechanics and functionality, it remains largely unknown how cells, in turn, affect the nonlinear mechanics of their surrounding matrix. Here we show that living contractile cells are able to generate a massive stiffness gradient in three distinct 3D extracellular matrix model systems: collagen, fibrin, and Matrigel. We decipher this remarkable behavior by introducing Nonlinear Stress Inference Microscopy (NSIM), a novel technique to infer stress fields in a 3D matrix from nonlinear microrheology measurement with optical tweezers. Using NSIM and simulations, we reveal a long-ranged propagation of cell-generated stresses resulting from local filament buckling. This slow decay of stress gives rise to the large spatial extent of the observed cell-induced matrix stiffness gradient, which could form a mechanism for mechanical communication between cells. How do cells measure their boundaries to tailor physiological responses? Much like modern day engineered devices, cells in the human body are able to make precise measurements: intestinal epithelial cells monitor local cell densities to prevent hyperplasia, neutrophils sample their microenvironment to compute the fastest migratory route toward infection sites, and epidermal stem cells use extracellular matrix occupancy to make cell fate decisions. What these examples illustrate is the sensitivity of complex cell behaviors to spatial and mechanical constraints, known in quantitative sciences as boundary conditions. Although the importance of boundary conditions in cell and tissue physiology is increasingly recognized, it remains unclear how cells sample their boundaries to tailor specific behaviors to boundary conditions. Here, using biophysical tools to manipulate cell boundaries in a highly controlled, quantitative manner, we found that cells estimate externally-imposed confinement using their largest and stiffest intracellular component, the nucleus. Cell confinement below a certain threshold deforms the nucleus and expands its envelope area. Unbuffered against area expansion due to slow turnover of constituents, the nuclear envelope becomes stretched. This in turn engages signaling via nuclear membrane stretch-sensitive proteins to the actomyosin cortex, activating contractility. The latter provides a motive force for the cell to squeeze through tight pores and constrictions in the extracellular matrix. Interestingly, no increase in cell contractility is observed when cells move through environmental confines that do not significantly deform the nucleus. Thus, the nucleus acts as an internal ruler for environmental confinement size, allowing cells to utilize energetically costly contractility on demand, only when surrounding space becomes restrictive. The advantage of the proposed mechanism is that in contrast to the plasma membrane, nuclear membranes do not participate in constitutive membrane trafficking; their surface area thus fluctuates less. This intrinsic quiescence should privilege them to function as low-noise detectors, to readily discriminate local environmental conditions from internal traffic-induced cell area/tension fluctuations. In nature, bacteria often engage in a range of collective behaviors. In this presentation, I will demonstrate how two bacterial behaviors, swarming and biofilm formation, are related by physical interactions, chemical signaling, and dynamical transitions. I will show how these collective behaviors arise from cell-cell interactions, and the physiological state of individual cells. Furthermore, I will introduce new experimental methods for investigating bacterial collective behaviors. Somitogenesis is the process by which the anterio-posterior axis is segmented in all vertebrates thus defining the coordinate system that will serve for positioning of the appendices and organs. This process of segmentation is due to the interaction between a posterior moving wavefront of morphogens and a posterior located clock generating somites (segments) at regular times and places. The existence and characterization of the clock has been amply demonstrated. In this talk I will focus on the molecular network behind the wavefront. I will discuss the wavefront response to various perturbations and compare our observations with a model of this network. Collagen type I, the most abundant protein of connective tissues (bones, dermis, tendons, etc), is a macromolecular mesogen that can form lyotropic liquid-crystal phases. With this approach, our team works on elaborating several biomimetic biomaterials. However, the use of collagen can be hindered due to its price and the possibility to easily denature into gelatine and noticeably during sterilization processes. In this context, we wanted to determine whether collagen could be partially replaced by gelatine without modification of the overall hierarchical structure of the biomaterial. Nanodiamond (ND) with Nitrogen-vacancy (NV) centers serves as promising bio-sensor due to its excellent bio-compatibility, high photo-stability, and the long spin coherence time at room temperature. However, the complicated biological environment, e.g. in a single cell, imposes stringent requirements on the sensor probes to be internalized. In this talk, I will discuss the requirements on nanodiamond as intra-cellular sensor, and the possible strategies that will enable various bio-sensing measurements. I will start with the understanding of nanodiamond-cell interfaces, from anchoring of ND on the plasma membrane to their internalization, and eventually to their intracellular trafficking. Other than the conventional three-dimensional trajectories tracking of the ND, it is also possible to track their orientations (rotation), providing additional information of the intracellular environment. One problem with NV based bio-sensing is that the NV center is less sensitive to certain parameters such as temperature and pressure, and not at all response to many other important biochemical parameters such as pH and non-magnetic biomolecules. I will also discuss possible schemes of constructing nanodiamond based hybrid sensors, which lead to significantly enhanced sensitivity and/or potentially enable the measurement of various biochemical parameters using NV based quantum sensing. Plants are often very flexible objects. This results in motion under stimuli such as wind or currents, but also hosts such as insects. Motion are known to influence plant development by thigmomorphogenesis. I will review methodologies and results from the past ten years, aimed at quantifying and understanding the vibration of plants, or parts of plants, from Arabidopsis Thaliana to large trees. I will focus on experimental techniques indoor and outdoor, on simple models of motions, and the role of the plant architecture. The recent application to high throughput plant phenotyping by vibrations will also be presented. Understanding how sensory systems process information is an open challenge. This is mostly because these systems are non-linear, making it extremely difficult to model the relation between the stimulus and the sensory response. In this talk I will discuss two strategies to tackle this problem and apply them to the retina. First, we use ex-vivo multi-electrode array experiments to record the retinal activity and directly model the ganglion cell response to complex stimuli, such as videos of moving objects. Here I will show that standard, nearly-linear, models are not enough and highly non-linear models are required. Then I will present the result of a closed-loop experiment where we adapted the stimulus on-line to investigate how the response changes when the visual stimulation is perturbed. With this approach we could estimate the optimal performance of a neural decoder and show that the non-linear sensitivity of the retina is consistent with an efficient encoding of stimulus information. -) U. Ferrari, C. Gardella, T. Mora, O. Marre. eNeuro, vol. 4, 6. 2017. Sensing the matrix: transducing mechanical signals from integrins to the nucleus. Cell proliferation and differentiation, as well as key processes in development, tumorigenesis, and wound healing, are strongly determined by the properties of the extracellular matrix (ECM), including its mechanical rigidity and the density and distribution of its ligands. In this talk, I will explain how we combine molecular biology, biophysical measurements, and theoretical modelling to understand the mechanisms by which cells sense and respond to matrix properties. I will discuss how the properties under force of integrin-ECM bonds, and of the adaptor protein talin, drive and regulate matrix sensing. I will further discuss how this sensing can be understood through a computational molecular clutch model, which can quantitatively predict the role of integrins, talin, myosin, and ECM receptors, and their effect on cell response. Finally, I will analyze how signals triggered by rigidity at cell-ECM adhesions are transmitted to the nucleus, leading to the activation of the transcriptional regulator YAP. Control of cell size is a fundamental adaptive trait that underlies the coupling between cell growth and division. Cells possess the unique ability to adapt their size and shapes in response to environmental cues, thereby translating extracellular information into decisions to grow or divide. However, the physical mechanisms mediating the regulation of cell size and division timing remain poorly understood. In this talk, I will discuss our recent discovery of an adaptive model of cell size control in bacteria, where the decision to divide is tightly regulated by the spatial patterning of cell wall growth modes. Using a combination of stochastic mechanical modelling and single-cell experiments, I will elucidate the implications of the size control model for cellular fitness adaptation under stress. In particular, our results show that morphological transformations provide fitness and survival advantages to bacteria under sustained antibiotic treatment. Living systems produce energy by oxidizing carbon : in aerobic organisms, a major step of this oxidation is processed by the respiratory chain in mitochondria. Energy production involves oxidation and subsequent ageing of the cellular materials. The control of their oxidative activity allows cells to remain far enough to the thermodynamic equilibrium and consequently the balance between respiration and ageing is a major regulation parameter of cell's fate. The key role of mitochondria in this phenomenon will be discussed. Experimentally, the control of the cellular oxidation is performed by using chosen photosensitizers. Due to their macrocycle, such molecules present very special photo-physical properties. Their light irradiation generates, through their triplet state, reactive oxygen species. The lifetime of these molecular species is very short and their action is very localized. To specifically target photosensitizers to one or the other cell compartments is thus the basis of their potential to modify and control the physiology of the cells. For example, the photo-chemical internalization (PCI) of macromolecules into cells is based on the photo-induced alteration of endosomal membranes - before their maturation in lysosomes - allowing the escape of the macromolecules, free to reach its targets within cell. More extensive photo-induced changes, in particular to the mitochondria, lead to cell death by necrosis or apoptosis. This photo-induced cell death is basis of an anticancer therapy so-called PDT. First, we focussed on the photo-induced modifications of the cellular trafficking. By combining measurements of local cytoplasmic viscosity and active trafficking, we found that photodynamic effect induced a only slight increase in viscosity but a massive decrease in diffusion. These effects are the signature of a return to thermodynamic equilibrium of the system after photo-activation. Secondly, to better apprehend such complex effects, we turned to model systems. In particular, we focused on photo-oxidation of membranes lipids, that are important oxidative targets. We extensively studied their modifications under photo-oxidation. Our purpose is to demonstrate that the photo-induced permeabilization of the membranes is correlated with a deep physical stress, which can be relaxed by various pathways, depending on its lipids composition, which is characteristic of the targeted cellular compartment. Living systems operate far from equilibrium due to the continuous injection of energy provided by ATP supply. The dynamics of the intracellular components is driven by both thermal equilibrium fluctuations and active stochastic forces generated by the molecular motors. Tracer particles are injected in living cells to study these fluctuations. Alternatively, vesicles which are already present in the cytoplasm serve as probes of the intracellular dynamics. To sort out genuine nonequilibrium fluctuations from purely thermal effects, we combine passive and active microrheology methods. They consist in measuring the spontaneous tracer fluctuations and extracting the response from an external oscillatory perturbation. By testing the fluctuation-dissipation theorem, we quantify the deviation from equilibrium appearing at low frequency. Removing the thermal contribution in the tracer fluctuations, we estimate the spectrum of the active forces. Eventually, we report non-Gaussian tails in the tracer displacement distribution as a result of directed motion events. We recapitulate theoretically the observed fluctuations by modeling the dynamics with a confining harmonic potential which experiences random bursts as a result of motor activity . This minimal model allows us to quantify the time and length scales of the active forces, along with the energy scale injected by the ensuing fluctuations [2, 3]. Finally, we estimate the energy dissipated by the tracers in the surrounding environment, leading us to define an efficiency of the energy conversion driving the tracer dynamics . Growth of solid tumors or metastasis requires, besides massive biomedical changes, also a spatial remodelling of the tissue. This remodelling, often including displacements of healthy tissue around, requires mechanical work to be done. These mechanics of growth has attracted a lot of attention in recent years, but still remains poorly understood. We use particle based simulations to study mechanical properties and effects in growing and motile tissues. These simulations have been helpful in understanding, interpreting and designing experiments. I will present an overview of the simulation technique, and how it contributed to recent developments in three dimensional tissue growth and collective cell migration. In a recent series of simulations and close experimental collaborations we found important interfacial and surface effects that lead to novel phenomena. For example, the tissue divides favorably at a free surface, even without any nutrient effects. This leads to the possibility and stability of a negative homeostatic pressure. In turn, a negative homeostatic pressure leads to naturally to finite steady states and tensile states. Chromosomes of a broad range of kingdoms, from bacteria to mammals, are structured by large topological domains, whose precise functional roles and regulatory mechanisms remain elusive. Using chromosome conformation capture technology, we unraveled the higher-order organization of the Bacillus subtilis, Escherichia coli and Vibrio cholerae genomes, in a variety of growth and mutant conditions. Different types of topological domains were found to structure these chromosomes, ranging from a few dozens to a thousand kb. We show that the matP/matS and parB/parS systems generate specific types of topological structures, regulated by replication and cell cycle progression. We have also functionally characterized some of the global organizational principles of these domains, in link with replication/segregation during the cell cycle. Overall, the comparative analysis of these different species provide striking insights on the diversity of the regulatory mechanisms of genome structure of the bacterial world. In addition, I will also present and discuss recent data obtained during the cell cycle of the eukaryotic species Saccharomyces cerevisiae. (1) Christophe Le Clainche and Marie-France Carlier. Regulation of actin assembly associated with protrusion and adhesion in cell migration. Physiological Reviews (2008) Apr;88(2):489-513. (2) Corina Ciobanasu, Bruno Faivre, Christophe Le Clainche. Integrating actin dynamics, mechanotransduction and integrin activation: The multiple functions of actin binding proteins in focal adhesions. European Journal of Cell Biology (2013) (92) 339-348. (3) Christophe Le Clainche, Satya P Dwivedi, Dominique Didry, Marie-France Carlier. Vinculin is a dually regulated actin filament barbed-end capping and side-binding protein. Journal of Biological Chemistry (2010) Jul 23;285(30):23420-32. Bacterial biofilms are organized communities of cells living in association with surfaces. 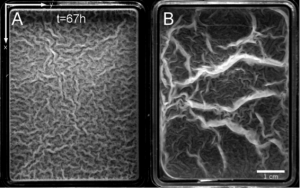 The hallmark of biofilm formation is a well defined spatio-temporal pattern of gene expression, leading to differentiation and a complex morphology. While this process resembles the development of a multicellular organism, biofilms are only transiently multicellular. More importantly the functions associated to the biofilm phenotype are largely unknown. A common feature of biofilm formation is the secretion of a polymeric matrix rich in sugars and proteins in the extracellular space. In Bacillus subtilis, secretion of the exopolysaccharide (EPS) component of the extracellular matrix is genetically coupled to the inhibition of flagella-mediated motility. The onset of this switch results in slow expansion of the biofilm on a substrate. Different strains have radically different capabilities in surface colonization: Flagella-null strains spread at the same rate as wild type, while both are dramatically faster than EPS mutants. Multiple functions have been attributed to the EPS, but none of these provides a physical mechanism for generating spreading. 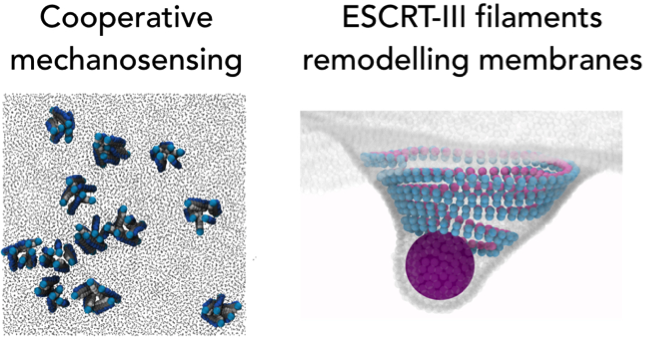 We propose that the secretion of EPS drives surface motility by generating osmotic pressure gradients in the extracellular space. A simple mathematical model based on the physics of polymer solutions shows quantitative agreement with experimental measurements of biofilm growth, thickening, and spreading. We discuss the implications of this osmotically driven type of surface motility for nutrient uptake that may elucidate the reduced fitness of the matrix-deficient mutant strains. Looking for the mechanical control of growth in plants. Is there a simple law? Plants are strikingly good at math, especially geometry. One could find parts or full plants shaped as spheres, circles, straight lines, and flat surfaces, golden and right angles and all sorts of exotic and pretty combination of shapes. These shapes are generated through complex tissue growth. We want to understand this puzzling beauty by focusing on the biophysical properties of the cell wall and its related biochemistry. We will present some of our results on dark grown hypocotyl and pavement cells demonstrating that pectin methylesterification status change is necessary for cell and tissue differentiation, growth and is related to changes in cell wall elasticity. Then we will expose puzzling results showing that cell growth rates are proportionate to the elastic stretching of the cell wall (Pressure divided by the Young modulus) and not plastic properties of the cell wall components. Finally, we will present preliminary experiments that could explain this paradox as well as some others such as microtubule partial correlation with oriented growth, and sound-induced plant growth. A broad range of biological processes such as morphogenesis, tissue regeneration, and cancer invasion depend on the collective dynamics of epithelial cells. Such dynamics are determined by an exquisite balance between intercellular adhesion, cytoskeletal tension, and intracellular pressure. To study this balance in a fully quantitative manner I will present new techniques to map physical forces between and within cells. Using these techniques we studied how cellular forces are regulated and transmitted by the proteins that comprise intercellular adhesion complexes. To do so, we perturbed the main molecular players of the intercellular adhesome using RNAi and studied how these perturbations impact physical forces and cellular velocities in epithelial cell collectives. We found that perturbations targeting adherens junctions, but also tight junctions, gap junctions, and desmosomes have a significant impact on cell velocities, cell deformations, cell-matrix traction forces, and cell-cell forces. We developed a cross-validation analysis to show that concentrations of cell-cell adhesion proteins are significant predictors of cell-cell forces. Finally, I will discuss the determinants of epithelial integrity in the presence of stretching and transepithelial pressure. Biological systems such as cells and tissue use non-equilibrium processes to actively generate mechanical stress, movement and growth. Some of these processes can actually be reconstituted in biomimetic experiments with active soft matter. In this talk, we will first discuss why and how contractile forces are generated by biological systems and how they can be measured with soft elastic substrates ("traction force microscopy"). Because kilo-Pascal stresses are typically transmitted through micrometer-sized contacts, the relevant force scale is nano-Newton. We then introduce different theoretical approaches to understand and model the contractility of biological matter. Because closed systems have to conserve momentum, the most central concept here is the one of a "force dipole", similarly as for the theoretical description of microswimmers, but now coupled to a mechanical rather than to a hydrodynamic environment. We present a stochastic theory for the biologically most relevant example of a contractile force dipole, namely the "myosin II minifilament". We then explain why on the large length scale of cells and tissue, the mechanical properties of these systems are dominated by tensions rather than by their elastic modulus, with dramatic consequences for their shape and force transmission to the environment. Morphologies of soft materials in growth, swelling or drying have been extensively studied recently. Shape modifications occur as the size varies transforming ordinary spheres, cylinders and thin plates into more or less complex objects. Existence of fibers exacerbates this complexity, giving anisotropy to the growth process itself. The growth is coupled to the environment, for bacteria the substrate, in pathology the healthy tissue. In pathological situations such as wound-healing or desmoplastic tumor growth, the immune system reacts with a battery of morphogenetic gradients, making a new tissue full of collagene and eventually sending active cells. All these factors contribute to a high level of compressive stress at the origin of patterns and deformity. I will show how we can predict quantitatively these patterns on the simple drop geometry of the biofilms and on the spherical shape of tumors. For the pathological cases, it turns out that the wrinkling process dominates the growth, deforming the tissues and exacerbating the immune system which reacts via passive (fibroblasts) and active cells (myo-fibroblasts). I will show that the consequence is a huge increase of the stiffness, which stops spontaneously when the healing is achieved but not in case of implants or tumors. Naive estimations can be given explaining difficulties encounted in drug treatments, for example. Joint work with Min Wu. Biological systems are normally high-interface systems and these surfaces are laden with biological molecules and cells that render them mechanically complex. The resulting nonlinearities with response to surface stresses and strain are often essential to their proper function and these are explored using recently developed methods that reveal an intricate interplay between applied stress and dynamic response. Two applications are discussed. 1. Vascular endothelial cells are nature's "rheologists" and line the interior walls of our blood vessels and are sensitive to surface shear stresses. These stresses are known to affect the shape and orientation of endothelial cells. It is evident that the spatial homogeneity of flow can affect vascular health and it is well-documented that lesions form in regions of high curvature, bifurcations, and asperities in blood vessels. Experiments are described where stagnation point flows are used to create regions of well controlled flow stagnation and spatial variation of wall shear stresses. Live-cell imaging is used to monitor the fate of cells attached to surfaces experiencing flow impingement and it is revealed that endothelial cells migrate and orient in such flows to create remarkable patterns of orientation and cell densification. This response, termed "rheotaxis", is used to explore mechano-transduction pathways within these cells. 2. The tear film of the eye is a composite structure of an aqueous solution of protein and biomacromolecules. This thin layer is further covered by a film comprised of meibomian lipids excreted during each blink. The purpose of the meibum has been largely unexplained although one prevailing suggestion is that it suppresses evaporation. Recent measurements in our laboratory demonstrate that this layer is strongly viscoelastic and this property has dramatic effects on the dynamics of the moving contact line and stability against dewetting. Gerald Fuller is the Fletcher Jones Professor of Chemical Engineering at Stanford University. He joined Stanford in 1980 following his graduate work at Caltech where he acquire his MS and PhD degrees. His undergraduate education was obtained at the University of Calgary, Canada. Professor Fuller's interests lie in studies of rheology and interfacial fluid mechanics. His work has been recognized by receipt of the Bingham Medal of The Society of Rheology, membership in the National Academy of Engineering, and honorary doctorates from the Universities of Crete, Greece, and Leuven, Belgium. How do organisms cope with natural variability to achieve well-defined morphologies and architectures? We addressed this question by combining experiments with live plants and analyses of stochastic models that integrate cell-cell communication and tissue mechanics. This led us to counterintuitive results on the role of noise in development, whereby noise is either filtered or enhanced according to the level at which it is acting. The interactions between amino acids in a protein are heterogeneous but not arbitrary: they enable proteins to perform specific biochemical "functions". Understanding these interactions may require, however, looking beyond current functional requirements, to the evolutionary history of proteins. I will illustrate this point with a simple statistical mechanics model, which I will motivate with observations and experiments on natural proteins. The model relates the parameters controlling the evolution of a protein to the organization of the interactions inside its structure. The mechanical behavior of a suspension of rigid and semiflexible filaments has been studied in great detail. In comparison the effect of the filament geometry has been relatively unexplored. Here, we hijack flagellar filaments from their original purpose in order to develop a versatile model rod-like bio-colloid whose shape and length can be tuned. We present experimental results on the rheological behavior of suspensions of (1) straight, (2) curly and (3) semi-straight/semi-curly flagella with an identical average contour length. We find that (1) and (2) show an elastic behavior at intermediate time but that (3) remains elastic and does not flow at long times. Using fluorescence microscopy, we track individual filament and find that this elastic plateau is related to a cage in which the filament is trapped for a certain among of time. Taken together, this highlights the role of filament geometry in suspension mechanics. Budding yeast cells have an asymmetrical division pattern. Each mother cell produces a limited number of smaller daughter cells before entering senescence and eventually dying. The detailed mechanisms that govern entry into senescence in mothers and daughter cell rejuvenation are still poorly understood. In this context, we have developed a microfluidic system that lets one monitor the successive divisions of single yeast cells in real-time under the microscope. Using this device, we have revisited classical paradigms associated with the age-dependent control of cell proliferation in this unicellular organism. Our results indicate that cells undergo a sharp transition to senescence, which is not related to the the loss of mitochondrial membrane potential, as previously proposed. Other applications of our methodology to the study of senescence induced by telomeres attrition and in other cellular biology contexts will be presented during the talk. Transport in crowded and complex media is a ubiquitous phenomenon in nature, which poses fundamental questions in statistical and soft matter physics. In particular, transport in the bustling interior of living cells is fascinating and far from understood. On a molecular scale, transport can be diffusive or driven, either externally or by local force generators. In this talk, I will introduce single-walled carbon nanotubes (SWNTs) as highly versatile multi-scale probes to investigate different modes of transport in media of increasing complexity: from the confined dynamics of semiflexible polymers in crowded environments to random stirring generated by non-equilibrium dynamics of the cell cytoskeleton. The ability of cells to perform essential processes such as migration or deformation relies on their cytoskeleton, and especially on the structures and networks formed by the actin polymer and its associated proteins. Understanding the dynamics and the mechanics of the actin filaments and its multiple partner is a major goal at the frontier of biology and physics. Our team developed a new experimental setup to study the mechanics of in vitro reconstituted actin networks, with an unprecedented throughput. This technique is based on self-organized chains of micron-size magnetic beads or cylinders where the controlled attractive dipolar force between the colloids deforms the actin networks. We characterized for the first time the mechanics of actin networks reconstituted with different concentrations of purified proteins, leading to networks of different architectures, and drew conclusions on the origin of the elasticity on these networks (Pujol et al PNAS 2012). We are now measuring mechanical properties of networks reconstituted from yeast extract which allows comparison between a wild type containing hundred different actin binding proteins to mutants lacking some of them. Our experimental setup was decisively improved by the fabrication of magnetic micro-objects of cylindrical or cubic shape (Tavacoli et al. Soft Matter 2013) allowing the deformation of actin networks between two flat surfaces. In this way, we can access properties of dense branched networks such as non-linear elasticity and Poisson modulus, which are required to test theoretical models of fiber networks (Mikado). We are currently studying the growth velocity of the actin gel as a function of an applied mechanical stress and the architecture of the networks. I will also present other applications of our magnetic methods to probe the mechanics of whole cells. Viruses are ubiquitous pathogens in all kingdoms of life and are major public health issues as well as economic and veterinary concerns worldwide. Despite a huge body of work dedicated to the molecular biology of viral life cycles, there are currently no physical models accounting reliably for the mechanisms by which the hundreds of molecular building blocks making up a virus fit into the final structure with a pinpoint accuracy. I will first present the self-assembly pathway of empty icosahedral capsids derived from a bovine virus. A kinetic model constructed from time-resolved X-ray scattering data reveals a cooperative mechanism involving an unexpected long-lived intermediate species. Then, I will give some insights into the packaging of polyelectrolytes by capsid proteins derived from a plant virus. Accurate measurements of the mass of packaged polyelectrolyte demonstrate a nonspecific selectivity that may play a crucial role for genome packaging in host cells. Quite generally, physics provides a useful framework to describe viral self-assembly and should eventually support the development of novel therapeutic strategies. As a wide band-gap material, diamond can contain a variety of atomic defects or impurities as color centers. Some of the color centers are highly luminescent, while others are luminescent with a very low quantum yield. For nanoscale diamonds (NDs) containing a high-density ensemble of vacancy-related defect centers, they are useful as nanoprobes for bioimaging and quantum sensing both in vitro and in vivo. In this seminar, we will show how ion-irradiated NDs can be routinely produced in our laboratory. Three examples of the applications by utilizing nitrogen-vacancy (NV−) centers and neutral vacancy (V0 or GR1) centers in NDs are discussed. First, we will present our results of using fluorescence lifetime imaging microscopy to achieve background-free real-time imaging of fluorescent NDs (denoted as FNDs) in living organisms such as C. elegans. With 100-nm FNDs conjugated with yolk lipoprotein complexes, we demonstrate that the nanoparticles serve well as a biomolecular nanocarrier without significantly altering the functionality of the cargos for intercellular transport, cell-specific targeting, and long-term imaging applications in vivo. Second, we report our recent work on the development of highly ion-irradiated NDs (denoted as INDs) as a photoacoustic contrast agent for deep-tissue imaging. The particles are so extensively damaged that graphitization occurs concurrently with the generation of the GR1 centers. Although the IND of ~40 nm in diameter has a much smaller absorption coefficient than gold nanorods (GNRs) of similar dimensions at 1064 nm, it shows a better performance due to higher thermal stability and a lower nanobubble formation threshold of the carbon-based nanomaterial. Finally, we apply the NV− centers in 100-nm FNDs for nanoscale temperature sensing by optically detected magnetic resonance. We conjugate FNDs with GNRs and employ them as both a nanoheater and a nanothermometer in solution and cells. The integration of heating and temperature sensing functions on the same particles opens an opportunity for active and high-precision control of temperature at the nanoscale by pure optical means. In all biochemical reactions occurring in living tissues, reactants have to form an encounter complex before the specific chemical step. Invariably, in order to reach their binding partners, biomolecules have to diffuse in complex environments, both very crowded with all sorts of other biomolecules and organelles and confining, due to the presence of different membranes and cytoskeletal structures that strongly compartimentalize the available space. In this talk, I will illustrate a general theoretical paradigm that we are developing in our group to solve this problem. Using addition theorems for spherical harmonics, we compute the diffusion rate to a sink in the presence of crowding agents that we model as spheres of arbitrary radius and endowed with arbitrary reactivity, from fully reflecting (purely excluded volume) to fully absorbing (competitive binding partners). We consider both diffusion in an unbounbded domain and diffusion occurring within a spherical domain, as an attempt to model encounters occurring within a cell. Different applications will be discussed, such as diffusion to a binding pocket in a coarse-grained model of protein and reactions occurring in vesicles and other kinds of nanoreactors. As they leave the blood stream and travel to lymph nodes or sites of inflammation, leukocytes are captured by the endothelium and migrate along the vascular wall to permissive sites of transmigration. These processes are supposedly orchestrated by chemical signals and take place under the influence of a strong hemodynamic shear stress. The role of flow on leukocyte crawling and extravasation remains generally an unsolved question, however crawling T lymphocytes were recently reported in vivo and in vitro to orient against the direction of flow and to move upstream like salmons in a river. This non-intuitive behavior is manifestly not a passive drift of cells pushed by the flow, and we sought here to clarify the origin, role and mechanism of this upstream flow mechanotaxis behavior. One of the defining qualities of soft matter is that it is readily driven far from thermodynamic equilibrium by external stress. Driving forces such as those due to an electric field or shear can drive colloidal suspensions and polymer networks into fascinating non-equilibrium patterns, such as banded or ordered steady states. By contrast, living cells naturally exhibit a unique form of internal driving in the form of chemomechanical activity. A prominent example is the cytoskeleton, a meshwork of protein polymers and force-generating motor proteins that constitutes the scaffold of cells. The cytoskeleton is responsible for driving vital cellular functions such as growth, division, and movement. In this talk, I will present two examples of our research on active cytoskeletal polymer gels. The first example concerns active contractility of the actin cortex, which lies underneath the cell membrane and drives shape changes by means of myosin motors. By reconstituting a simple model system composed of purified proteins, we could show how myosin motors and actin filaments collectively self-organize into force-generating arrays. We discovered that motors contract actin networks only above a sharp threshold in crosslink density, corresponding to a connectivity percolation transition. Surprisingly, the motors tend to drive initially well-connected networks robustly to this critical point. The second example I will discuss concerns cell shape polarization directed by interactions of actin filaments with microtubules. I will show that active force generation by growing and shrinking microtubules leads to feedback between the organization of the actin filaments and microtubules, explaining earlier observations made in living cells. Active transport is important for proper cellular organization and functioning. Such transport is driven by a large variety of molecular motor proteins that can walk over cytoskeletal biopolymers such as microtubules and F-actin. Whereas controlled biophysical experiments using purified components have revealed many of the basic properties of these fascinating machines, much less is known about their specific intracellular activity and about the interplay between cytoskeletal organization and transport. To address these questions, we have developed novel tools to control the activity of specific motors inside cells. These experiments have revealed different mechanisms by which the underlying organization of the microtubule network guides motor transport to specific destinations. In addition, these tools enabled us to remote-control intracellular transport and alter cellular behavior using light. Lukas Kapitein is assistant professor at the Division of Cell Biology of Utrecht University, where his group develops novel approaches to understand how the cytoskeleton and their associated motor proteins contribute to cellular organization and morphology. The combined use of well-controlled, inducible intracellular transport assays and fluorescence nanoscopy of the cytoskeleton offers unique insights into the interplay between cytoskeletal organization and motor-driven transport. Nous nous intéressons au lien entre l'organisation du collagène dans les tissus mous (comme la peau ou les tendons) et leurs propriétés mécaniques. Pour cela, nous avons mis au point avec le LOB de l'Ecole Polytechnique un montage original qui combine une machine de traction avec un microscope à Génération de Seconde Harmonique. Cette microscopie non-linéaire permet d'image les fibrilles de collagène en 3D et sans marquage dans un tissu, donnant accès à son organisation à l'échelle micrométrique. We avons validé ce dispositif sur le tendon, avant de l'utiliser sur d'autres tissus. Bacterial biofilms refer to communities of bacteria that self-assemble into an extracellular cohesive matrix on a surface. We are recently interested in floating biofilms formed by wild strains of Bacillus subtilis on liquid medium. Wrinkles appear during their maturation. We have studied the formation of wrinkles in relation to their mechanical property and have shown that they could be due to a buckling instability. In this talk I will present our experimental results and their theoretical interpretations. 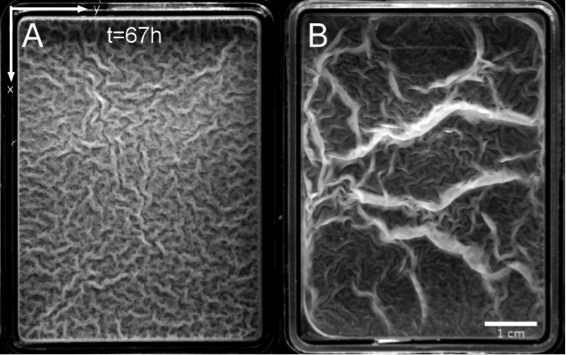 Trejo M., C. Douarche, V. Bailleux, C. Poulard, S. Mariot, C. Regeard, E. Raspaud, Elasticity and wrinkled morphology of Bacillus subtilis pellicles. Proc Natl Acad Sci USA 110 (2013), 2011-2016. In Clathrin-mediated endocytosis, Clathrin assembles into a soccerball-like structure at the plasma membrane that was proposed to deform the membrane by scaffolding. However, controversies in the community have appeared on the exact role of Clathrin: does its polymerization force is sufficient to curve the membrane, or deformation by other means (protein insertion) is required? We studied the formation of Clathrin buds from Giant Unilamellar Vesicles, and found that the pits can be flattened when membrane tension is increased. This suggested that the Clathrin polymerization force could be counteracted by membrane tension, which we further proved by directly measuring Clathrin polymerization force: by pulling a membrane tube out of a GUV aspirated in a micropipette, we can measure the force required to hold the tube through an optical tweezer system. When Clathrin is added, it polymerizes onto the GUV predominantly, and the force drops. From these measurements, we can deduce that the polymerization strength of Clathrin is in the range of a few hundred micronewtons per meter. This value confirms that clathrin polymerization can be counteracted efficiently by membrane tension. To finalize endocytosis, the clathrin-bud needs to be separated from the plasma membrane. Membrane fission requires the constriction and breakage of a transient neck, splitting one membrane compartment into two. The GTPase Dynamin forms a helical coat that constricts membrane necks of Clathrin-coated pits to promote their fission. Dynamin constriction is necessary but not sufficient, questioning the minimal requirements for fission. Here we show that fission occurs at the edge of the Dynamin coat, where it is connected to the uncoated membrane. At this location, the specific shape of the membrane increases locally its elastic energy, facilitating fission by reducing its energy barrier. We predict that fission kinetics should depend on tension, bending rigidity and the Dynamin constriction torque. We verify that fission times depend on membrane tension in controlled conditions in vitro and in Clathrin-mediated endocytosis in vivo. By numerically estimating the energy barrier from the increased elastic energy, and measuring the Dynamin torque, we show that: 1- Dynamin torque, ≈1nN.nm, is huge but necessary to achieve constriction, and 2- Dynamin work sufficiently reduces the energy barrier to promote spontaneous fission. Cell migration requires the generation of branched actin networks that power the protrusion of the plasma membrane in lamellipodia. The Arp2/3 complex is the molecular machine that nucleates these branched actin networks. This machine is activated at the leading edge of migrating cells by the WAVE complex. The WAVE complex is itself directly activated by the small GTPase Rac, which induces lamellipodia. However, how cells regulate the directionality of migration is poorly understood. Here we identify a novel protein that inhibits the Arp2/3 complex in vitro, Arpin, and show that Rac signalling recruits and activates Arpin at the lamellipodial tip, like WAVE. Consistently, upon depletion of the inhibitory Arpin, lamellipodia protrude faster and cells migrate faster. A major role of this inhibitory circuit, however, is to control directional persistence of migration. Indeed, Arpin depletion in both mammalian cells and Dictyostelium discoideum amoeba resulted in straighter trajectories, whereas Arpin microinjection in fish keratocytes, one of the most persistent systems of cell migration, induced these cells to turn. The coexistence of the Rac-Arpin-Arp2/3 inhibitory circuit with the Rac-WAVE-Arp2/3 activatory circuit can account for this conserved role of Arpin in steering cell migration. Loss of this inhibitory circuit promotes exploratory behaviors and might commit carcinoma cells to the invasive state. Bacteria are the most abundant organisms in the world. Studying models of bacterial chromosome dynamics in the cytoplasm is very important to understand how bacteria adapt to different growth environments and in response to stimuli. Optical labeling is one of the most common methodologies used for bioanalytical purposes. The fundamental issues for any fluorescent material are the same: brightness and stability. In the quest for very bright and stable labels, novel polymer-based, self-stabilized, fluorescent nanoparticles (FNPs) and fluorescent polymer chains (FPCs) have been developed in the PPSM laboratory. They are brighter, more stable, photobleach slowly and are more easily functionalized compared with other fluorescent labels like GFP and QDs. A methodology to insert these FNPs (60nm) into E.coli bacteria was developed. To control if the FNP are indeed internalized, we developed a protocol based upon FNP luminescence quenching by methylene blue. Biotin conjugated FNPs could be used to study specific membrane proteins. By using a strepdavidin-biotin link, we made a “Sandwich” to build a bridge between particles, specific antibodies and bacteria. Negatively charged FPCs can easily enter into E.coli bacteria. It is found that FPCs can label the cytoplasm but not the DNA, which appears to be more compact. These unique properties will allow the study of DNA and cytoplasm viscosity changes during bacterial growth. Bundles of filaments are universal elements that belong to the intracellular skeleton of eukaryotic cells. The anaphase spindle from fission yeast is an excellent example of such bundle that assembles repeatedly in the same manner at every cell division. It is also an excellent experimental system since yeast cells can easily be perturbed genetically, and their spindle is visualized using electron or light microscopy. The spindle is under compression at anaphase and based on electron tomographic reconstructions of its constituent microtubules, we calculated that the length and organization of microtubules within the fission yeast spindle are optimized to achieve maximal strength while minimizing the use of material. A combination of simulations and live cell imaging further indicated which of the properties of the microtubule cross-linkers are likely to be responsible for such a precise regulation of spindle morphology, and the synergy that exists between the cross-linkers in fission yeast. 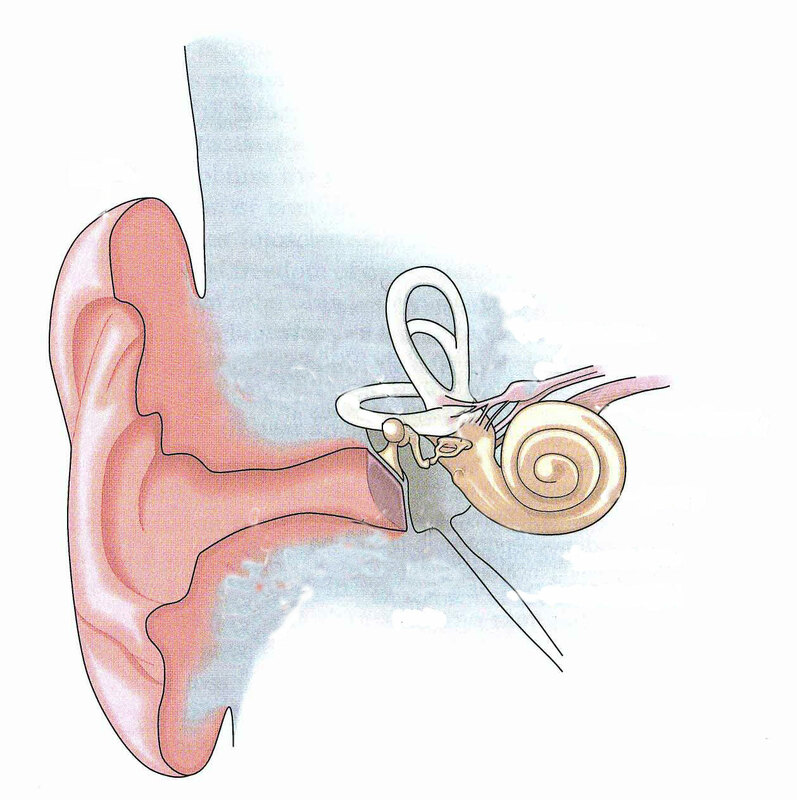 The ear works as a remarkable sound detector. Hearing can indeed operate over six orders of magnitudes of sound-pressure levels, with exquisite sensitivity and sharp frequency selectivity to weak sound stimuli. Curiously, the ear does not work as a high-fidelity sound receiver, introducing in the auditory percept “phantom” tones that are not present in the sound input. In this talk, I will present micromechanical experiments at the level of the cellular microphone of the inner ear – the hair cell – whose function is to transduce sound-evoked vibrations into electrical nervous signals. In particular, I will show that hair cells can power spontaneous oscillations of their mechanoreceptive hair bundles, a tuft of cylindrical protrusions that protrudes from the apical surface of each cell. The oscillatory instability is thought to result from a dynamical interplay between ion channels, elastic proteinous linkages and active molecular motors. We find that oscillations of the hair bundle allow the hair cell to actively resonate with its mechanical input at the expense of distortions with properties that are characteristic of hearing. I will conclude by arguing that our results promote a general principle of sound detection that is based on nonlinear amplification by self-sustained “critical” oscillators in the inner ear, i.e. active dynamical systems that operate on the brink of a Hopf bifurcation. Genome structure and dynamics attacts considerable attention in the biology community to eludicate genome regulation principles, but also for biological physicists who aim to develop models of DNA in vivo. The challenges of this research is conceptual but also economical because of expected impact of DNA sequencing or DNA microarrays technologies in personalized diagnostics. Our research is carried out at the nexus of technology and biology and aims to provide a physical description of the genome structural properties. We will first overview our results on chromosome dynamics in living yeast, showing the unexpected flexibility of these structures in vivo. We will then focus on new methods for chromosome analysis in vitro based on micro- and nano-fluidics, and we will finally emphasize that that these two topics are not so unrelated, given that the physics of DNA confined environment can be used as a common research framework. Förster Resonance Energy Transfer (FRET) allows measuring the distance between two spectrally distinct fluorophores, in the 20-100 Å range. When monitored at the single molecule level, smFRET is useful in resolving subpopulations, or observing conformational changes as a function of time within single macromolecular complexes in vitro. I will describe here the methodologies used to measure FRET accurately on single biomolecular complexes, freely diffusing in solution or immobilized on surfaces. I will then focus on our studies on the mechanism of prokaryotic transcription such as antitermination control by the antiterminator LicT, and Rho-induced transcription termination. The mammalian brain is astonishingly diverse. Not only its size varies several orders of magnitude – from the 3 grams of the mouse brain to the 6 kg of the blue whale brain – but also its geometry and function. There is indeed a striking, largely unexplained, relationship between the folding of the mammalian brain and its cellular, functional and connective organisation. Brain folding appears as much more than a mere mechanical epiphenomenon, and besides its major evolutionary relevance, many psychiatric disorders such as autism or schizophrenia, are related to changes in brain folding. I will present a brief overview of the developmental processes leading to the folding of the brain, and show some examples of functional correlates of brain folding in humans and other mammalian species. Finally, I will discuss some of the current theories proposed to explain the mechanism underlying the relationship between brain geometry and brain organisation, including our ongoing project on computational modelling and analysis of the development of the ferret brain. Despite ~10% of the human genome being comprised of secretory proteins, little is known about the dynamics of proteins inside the secretory granule before and during fusion with the plasma membrane. This talk presents early results on measuring the diffusion coefficient of two proteins within that submicroscopic and closed space, and relates the results to secretion and local membrane deformation rates during the fusion event. The techniques used, TIR-FRAP, TIR-FCS, and pol-TIRF have general applicability, and the theory and practice of especially the first two is discussed. Understanding the intriguing complexity of living systems is one of the main driving forces of science. To gain insight we use biomimetic systems that reconstitute well defined cellular assemblies and compare these to the living system. Our main interests are the mechanical properties and the generation of forces, both mediated by the cytoskeleton and its interaction with the plasma membrane. Recent advances allow to mimic structures such as the actin cortex, sparse actin networks and actin bundles, and we use optical tweezers to quantify the mechanical properties of these structures and to compare them to living cells. While sparse actin networks and polymerizing actin bundles show rather passive behavior, we apply the same measurement methods to living cells such as cell blebs and red blood cells which allow to study the out-of-equilibrium mechanics of these systems, and to determine the timescale at which the system's activity becomes evident. Models describing the growth of cell populations have been developed based on assumptions on the stochastic mechanisms underlying growth and division at the single cell level. In particular, two different models have been widely used for decades, assuming that cell division probability depends respectively on cell age (the renewal equation) or cell size (the size-structured or growth-fragmentation equation) - or both. We confront these models with data on E. coli single cells growth, and develop a new estimation methodology, based on nonparametric functional testing within the PDE models, in order to test the hypothesis of an age-dependent versus size-dependent division rate. We conclude that in E. Coli, the division is controlled by a size-sensing rather than timing mechanism. This is a joint work with L. Robert and M. Hoffmann. The mechanism of muscle contraction, residing in nano-scale interaction between actin and myosin filaments, was intensely studied by using fast loading protocols. These experiments revealed the important mechanical role of the internal conformational change inside protruding myosin heads known as the power-stroke. It was realized that fast force recovery after abrupt loading, taking place at 1 ms time scale, is a purely mechanical phenomenon linked exclusively to the power-stroke and not limited by metabolic fuel delivery. In this presentation, we explore previously unnoticed difference in fast force recovery taking place in hard and soft loading devices and propose a purely mechanical model that explains the origin of this unusual behavior. We link the inequivalence of soft and hard loading ensembles to the presence of long range interactions between the individual actin-myosin cross-links known as cross-bridges. Our fit of experimental data suggests that 'muscle material' is finely tuned to perform close to a critical point which explains large fluctuations observed at stall forces. The proposed mean field model clarifies the collective nature of the power-stroke and reveal new properties of the celebrated Huxley and Simmons 1971 model. Conventional epifluorescence microscopy is limited in resolution (to about 200 nm laterally, 600 nm axially) by the shere nature of light (by diffraction), and is hence insufficient to study the nanostructure of subcellular components. At IMB-Mainz and Heidelberg University we have established a variety of superresolution microscopy ("nanoscopy") methods, for example Structured Illumination SMI and Localisation microscopy SPDMphmyd with blinking dyes, like standard GFP. Our microscope systems can and have been applied to study the composition, function and metabolism of many biomolecular structures and small paticles like single viruses in high densities. Currently we reach a resolution down to 5 nm in 2D and 40 nm in 3D in the co-localization mode. There are various applications in the fields of molecular biology, (clinical) medicine, diagnosis and pathology. Kaufmann R, Muller P, Hausmann M and Cremer C (2011). Imaging label-free intracellular structures by localisation microscopy. Micron, 42, 348-352. Kaufmann R, Müller P, Hildenbrand G, Hausmann M and Cremer C (2011) Analysis of Her2/neu membrane protein clusters in different types of breast cancer cells using localization microscopy. Journal of Microscopy, 242, 46-54. Gunkel M, Erdel F, Rippe K, Lemmer P, Kaufmann R, Hoermann C, Amberger R and Cremer C (2009). Dual color localization microscopy of cellular nanostructures. Biotechnology Journal, 4, 927-938. The ability of arterial endothelial cells, the cells lining the inner surfaces of blood vessels, to respond to mechanical forces associated with blood flow is essential for normal vascular function. Abnormalities in endothelial cell mechanotransduction play a critical role in the development and progression of cardiovascular disease. The mechanisms governing how endothelial cells sense mechanical forces on their surfaces and how they subsequently transmit these forces within the intracellular space remain poorly understood. In this talk, I will present experimental and computational results in support of a central role for the cellular cytoskeleton in force transmission within endothelial cells. Because endothelial cells are often simultaneously exposed to multiple biophysical stimuli, I will show data that demonstrate that endothelial cells integrate biophysical stimuli derived from simultaneous apical cellular stimulation by flow and basal stimulation by nano-scale substrate patterning. Finally, I will discuss the role of proteins that link the cytoskeleton to the nucleus in modulating mechanotransduction in endothelial cells. Myosin II motors drive contractility of the cortical actin network, enabling shape change and cytoplasmic flows underlying diverse physiological processes ranging from cell division and migration to tissue morphogenesis. Yet, despite its importance, the mechanisms that describe contractility and the generation of mechanical forces within the cortex are not well understood. We recapitulate contractility in vitro, through the development of a minimal model of the cell actomyosin cortex by coupling a two-dimensional, cross-linked F-actin network decorated by myosin thick filaments to a model cell membrane. Myosin motors generate both compressive and tensile stresses on F-actin and consequently, induce large bending fluctuations. Over a large range of crosslinking, we show the extent of network contraction corresponds exactly to the extent of individual F-actin shortening via buckling. This demonstrates an essential role of buckling in facilitating local compression to enable mesoscale network contraction of up to 80% strain. Buckled F-actin at high curvatures are prone to severing and thus, compressive stresses mechanically coordinate contractility with F-actin severing, the initial step of F-actin turnover. Finally, the F-actin curvature acquired by myosin-induced stresses can be further constrained by adhesion of the network to a membrane, accelerating filament severing but inhibiting the long-range transmission of the stresses necessary for network contractility. Thus, the extent of membrane adhesion can regulate the coupling between network contraction and F-actin severing. These data demonstrate the essential role of the non-linear response of Factin to compressive stresses in potentiating both myosin-mediated contractility and filament dynamics. RNA-dependent RNA polymerases (RdRPs) are essential enzymes that govern transcription and replication in RNA viruses. While RNA elongation forms an important therapeutic target against viral infection, little is known about elongation dynamics at the single-molecule level. Here, we study the well-established RdRP model system of P2 from the double-stranded RNA bacteriophage Φ6 using high-throughput single-molecule force-spectroscopy combined with theoretical modeling. We show that P2 elongation dynamics is irregular, with rapid transcription repeatedly interrupted by pauses whose durations vary from seconds to thousands of seconds. Exploiting the discriminatory power offered by our large datasets, together with specifically-adapted analysis, we introduce a stochastic dynamical model of P2 transcriptional elongation. Our results imply that the majority of pauses result from nucleotide misincorporation, providing a direct link between RdRP dynamics and error rates—rates that offer potential drug targets, as they must be finely tuned to confer both genome stability between generations and adaptability to bypass host defense systems. Recent advances in cell therapy and tissue engineering opened new windows for regenerative medicine, but still necessitate innovative techniques to create and image functional tissues. One promising approach is to associate magnetic nanoparticles with cells in order to supply them with sufficient magnetization to be detectable by MRI or manipulated by magnetic forces, while maintaining cell viability and functionalities. A few years ago, we proposed the use of anionic iron oxide nanoparticles as efficient agents for cell internalisation without impacting cell functions. Recently we examined the influence of the amount of internalized iron and the state of nanoparticle aggregation on the capacity for mesenchymal stem cell differentiation and MRI single cell tracking. We then demonstrated that high resolution Magnetic Resonance Imaging (MRI) allowed combining cellular-scale resolution with the ability to detect two cell types simultaneously at any tissue depth. In parallel, we addressed the challenge to create a functional tissue from stem cells in vitro. 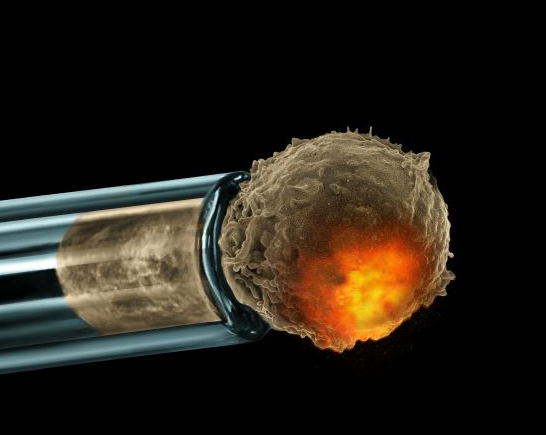 The aim was to confine stem cells in three dimensions at the millimetric scale by using home-designed miniaturized magnetic devices, in order to create cellular patterns for stem cell differentiation and tissue engineering. Finally magnetic nanoparticles show also great promises for antitumor cell therapies, in particular using the magnetic hyperthermia modality. Cellular internalization of magnetic nanoparticles localizes the source of heat in the internal volume of the cell, with direct application for tumor cell therapies. The combination of cell-derived vesicles with magnetic nanoparticles creates multifunctional bio-inspired nanovectors with promising potential for diagnosis and therapy. Le ribosome est le moteur moléculaire traduisant le code génétique de l’ARNm en protéine. La dynamique de ce processus asynchrone primordial est encore mal connue, surtout chez les eucaryotes. Pouvoir suivre des ribosomes individuels pendant la traduction est donc un enjeu important. Nous présentons dans ce séminaire différentes stratégies permettant d’étudier la vitesse d’élongation de ribosomes individuels par microscopie de fluorescence en réflexion totale. Nous avons tout d’abord utilisé des ribosomes procaryotes mutants que nous avons marqués avec un nano-cristal semi-conducteur fluorescent. Nous avons ainsi pu mesurer la vitesse globale de traduction d’une protéine. Nous avons ensuite hybridé des oligonucléotides fluorescents sur l’ARNm, les départs des marqueurs signalant alors le passage des ribosomes à leurs emplacements. Nous avons alors utilisé des ribosomes eucaryotes, encore très peu étudiés à l’échelle de la molécule unique. Les ribosomes sont initialement immobilisés sur l’ARNm grâce à une IRES, structure secondaire spécifique permettant une initiation non canonique du ribosome. Puis suite à l’injection d’un système de traduction in-vitro, ils peuvent traduire la protéine et atteindre les oligonucléotides marqués, qu’ils détachent grâce à leur activité hélicase. Ces dissociations se traduisent par une disparition du signal de fluorescence des marqueurs qui diffusent hors de l’onde évanescente. Nous avons ainsi pu observer la distribution des durées de traduction jusqu’à des endroits spécifiques de l’ARNm. Nous avons pu extraire deux durées caractéristiques pour l’élongation. La première (typ. 40 s) est associée au premier cycle d’élongation, ralentie par le fait que le ribosome doit s’extraire de l’IRES. La seconde (~1s) correspond à un cycle d’élongation normal. Sorting of cargoes in endosomes occurs through their selective enrichment into sorting platforms, where transport intermediates are generated. The WASH complex, which is recruited from the cytosol to endosomes, activates the Arp2/3 complex and hence actin polymerization onto such sorting platforms. Here, we analyzed the role of actin polymerization in the physiology of endosomal domains containing WASH using quantitative image analysis. Using a novel colocalization method that is insensitive to the heterogeneity of size and shape of endosomes, we show that preventing the generation of branched actin networks induces endosomal accumulation of the WASH complex. Moreover, we found that actin depolymerization induces a dramatic decrease in the recovery of endosomal WASH after photobleaching. These results suggest a built-in turnover, where the actin network, i.e. the product of the WASH complex, contributes to the dynamic cytosol/endosome exchange of the WASH complex. Our data also suggest a role of actin in the lateral compartmentalization of endosomes: discrete WASH domains coalesce upon actin depolymerization or Arp2/3 depletion. Thus, branched actin networks are involved in the regulation of WASH domain size. I will finally discuss the potential role of lipid repartitioning in these sorting platforms and of the ensuing line tension that could develop at the domain boundary. This may provide a dynamin-independent contribution to membrane scission. The molecular machinery responsible for faithful segregation of the chromosome in bacteria such as Caulobacter crescentus and Bacillus subtilis includes the ParABS a.k.a. Spo0J/Soj partitioning system. In Caulobacter, prior to division, hundreds of ParB proteins bind to the chromosome near the origin of replication, and localize to one pole of the cell. Subsequently, the ParB-DNA complex is translocated to the far pole by the binding and retraction of the ParA spindle-like apparatus. Remarkably, the localization of ParB proteins to specific regions of the chromosome appears to be controlled by only a few centromeric parS binding sites. Although lateral interactions between DNA-bound ParB are likely to be important for their localization, the long-range order of ParB domains on the chromosome appears to be inconsistent with a picture in which protein-protein interactions are limited to neighboring DNA-bound proteins. We propose a simple model to study the localization and condensation of the ParB-DNA complex, which includes both lateral and 3D protein-protein interactions among DNA-bound ParB proteins. Our model shows how such interactions can condense and organize the chromosome spatially, and can control both the localization and the long-range order of the DNA-bound proteins. Interestingly, the condensed ParB-DNA complex adopts a topology in which loops of DNA extend outside the cluster exposed for transcription; this structure may have implications for expression levels of genes in the vicinity of the parS site. It has recently been suggested that the competition for a finite pool of microRNAs (miRNA) gives rise to effective interactions among their common targets (competing endogenous RNAs or ceRNAs) that could prove to be crucial for post-transcriptional regulation (PTR). I shall discuss a minimal model of PTR where the emergence and the nature of such interactions can be characterized in detail at steady state. Sensitivity analysis shows that binding free energies and repression mechanisms are the key ingredients for the cross-talk between ceRNAs to arise. Interactions emerge in specific ranges of repression values, can be symmetrical (one ceRNA influences another and vice-versa) or asymmetrical (one ceRNA influences another but not the reverse) and may be highly selective, while possibly limited by noise. Finally, I will show that non-trivial correlations among ceRNAs can emerge in experimental readouts due to transcriptional fluctuations even in absence of miRNA-mediated cross-talk, so that more refined analyses will be needed to identify signatures of cross-talk in the transcriptome. DNA replication is an essential step of the cell cycle. Despite many biochemical studies, physical approaches can still bring new informations on some process of DNA replication. In vitro, using micromanipulation tools, we have shown that force can trigger some DNA polymerases into an exonuclease mode where, instead of synthesizing DNA, the polymerase goes backward and removes nucleotides. This can lead to a mechanical method for DNA sequencing. In vivo, in E. coli, using single molecule fluorescence techniques we have quantified the real time composition of the replisome, the machinary that copies DNA. We observed a time variation of the composition of the replisome with a number of DNA polymerases that varies from 2 to 3. We will see how these fluctuations are related to the synthesis of the so called Okazaki fragments. We will describe what happens to this scenario when the replication is blocked under specific conditions. Our team is interested in the functions of tubulin posttranslational modifications. Tubulin, the building block of the microtubules, is modified by a range of very special posttranslational modifications, such as enzymatic generation of glutamate or glycine side chains, enzymatic removal and re-addition of a C-terminal tyrosine. These modifications take place once the tubulin has polymerized into microtubules, which suggests that they encode information important for the functional specification or the fine-tuning of specific microtubule functions. While the modifications have been known for a long time, functional studies have remained difficult because nothing was known about the enzymes responsible for these modifications. The recent discovery of most of these enzymes in our team has allowed us to start functional and mechanistic studies that gave us first insights into the divergent roles of tubulin posttranslational modifications. In my presentation, I will give an overview of our first results, our ongoing projects and interests. In this talk I discuss first the properties of the actin cortical layer in contact with the plasma membrane of a cell using the hydrodynamic theory of active gels: within this framework, the cortical layer can be viewed as an active prewetting layer. I then discuss cytokinesis which is last stage of cell division when the two daughter cells separate. Cytokinesis proceeds by the formation of an actin contractile ring at the equator of teh cell and by contraction of this ring. The ring formation induces tension gradients in the cortical layer and a cortical flow. Using active gel theory, it is shown numerically that cytokinesis can only be completed if the activity gradient is large enough and that the radius of the contractile ring decreases linearly with time in agreement with experiments. The statistics of fluctuations in biological pathways and its relation to the response to environmental stimuli will be discussed. We shall specifically focus on bacterial chemotaxis, where detailed experiments and reliable models are available. A novel non-invasive experimental method to measure the chemotaxis response will first be presented. By using fluctuation relations, we then relate appropriate steady-state correlations to the response of the system to step and ramp stimuli of arbitrary amplitudes. That provides a systematic explanation for the observed relation between fluctuations and response and it also reconciles the out-of-equilibrium nature of the dynamics with the apparently standard form of the fluctuation-dissipation relation. Understanding the dynamics at play during embryonic and tissue development requires tissue-scale measurements with subcellular resolution. Nonlinear microscopy is attractive for live studies because it provides tissue 3D imaging and provides several contrast mechanisms. Intrinsic coherent signals such as second- and third-harmonic generation (SHG, THG) provide structural information and can be used in conjunction with fluorescence (2PEF) imaging. SHG signals are specifically obtained from dense organized structures, whereas THG signals are obtained from optical heterogeneities and provide images of the tissue morphology. We will discuss these principles and applications such as imaging the microstructure of intact unstained corneas, and reconstructing the early development of zebrafish embryos. Finally, we will discuss ongoing efforts to improve the capabilities of nonlinear microscopy for imaging developing tissues at advanced stages, such as wavefront control for aberration correction, and simultaneous excitation of multiple fluorescent proteins. Supatto et al, Curr. Opin. Gen. Dev. 21 538 (2011). Aptel et al, Invest. Ophtalmol. Vis. Sci. 51, 2459 (2010). Olivier et al, Science 339, 967 (2010). Zeng et al, Biomed. Opt. Express 3, 1898 (2012). Mahou et al, Nat. Methods 9 815 (2012). The most ubiquitous and accessible non-equilibrium systems around us are in the form of living organisms. Motivated by pattern formation and random motion that are driven by active (out-of-equilibrium) processes in cells we investigate the similarities and differences between such motion and thermal random motion. A simple theoretical model of a kicked particle is used to extract analytic and numerical results which we then compare to observations of membrane fluctuations in cells, and fluctuations in active gels reconstituted in-vitro.